View the FULL STORY —> “BANKRUPTCY and the BARNET FAMILY” <– click link . It was published in Shemot, the Journal of the Jewish Genealogical Society of Great Britain. 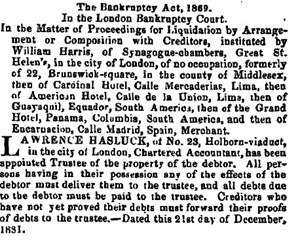 My thanks to Morlin who has supplied me with extracts from a copy of the London Gazette (see below) in 1881 which details William Harris Senior’s “Liquidation by Arrangement” which is (explained by John Gould) technically not quite the same as bankruptcy and does not have all the drastic legal consequences (e.g. severe limitations on obtaining future credit). The extract details his various addresses and the countries with which he did business in in South America before ending up in Calle Encarnación in Madrid. 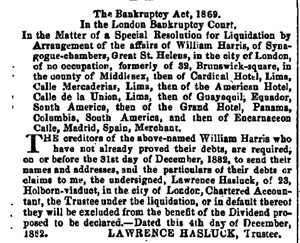 Morlin has explained that it was obviously a very difficult time for people trading with this area of South America, as there were earthquakes and political upheavals, and the insolvency listings at the time were littered with people connected with Lima going under. The 1881 census shows that Williams wife and family had moved back into the family home of her father. The “liquidation” is most likely the reason.